You have ever asked yourself “Why do I have a hard time reaching up overhead.” For the gym junkies this often comes up as “Why is it so hard to hold weight overhead?” For the frequent flyer this comes up as “why is it so hard to put things in the overhead compartment?” And for those of you who have been told you have “tight lats” this post should provide you with some insight. The shoulder is really two separate joints: The shoulder blade on the rib cage (scapulo-thoracic) and the arm bone on the shoulder blade (gleno-humeral). 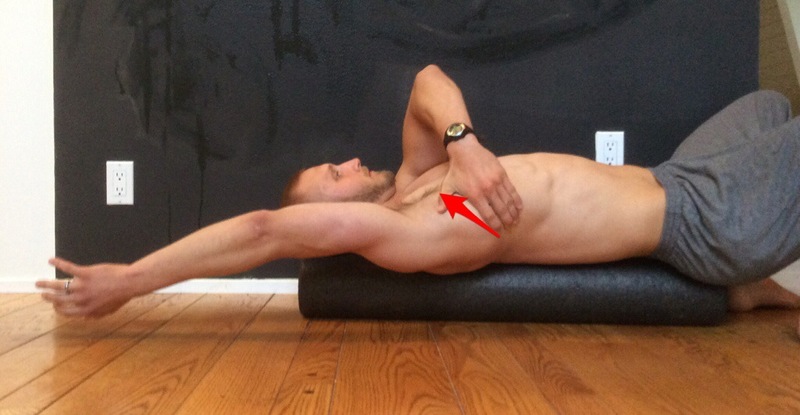 The sum of the range of motion of these two joints adds up to your ability to reach overhead. While once joint can compensate for the other to a small degree, full mobility in both joints is ideal. Step 1. Lie face up on a narrow foam roller.The back of your head, upper back, lower back and sacrum must all touch the foam roller throughout the entire duration of the test. (If you have a naturally large arch in your lower back, place your hand flat on the ground under your lower back and press your lower back into your hand). You must maintain contact between your lower back and the surface during the entire test. Step 2. Raise your arm directly overhead. PASS: Upper arm is parallel to your torso, the lower rib cage does not flare out and the motion is not painful. FAIL: Even though the arm is beyond the parallel, the test is failed because the lower ribs flare out and the lower back is arched. Try the test again without arching the back or flaring the ribs. *If you feel discomfort at the top of the shoulder with this motion then grab your shoulder blade with the other other hand and pull it along the side of your body until the bottom corner is at the middle of the side of your body (mid-axillary line). If this relieves the discomfort then try to do the test again while moving the shoulder blade without your hand assisting. If this does not relieve the discomfort, then stop the test and consult a physical therapist or other healthcare professional. Rx: If you fail test A, do stretch A. You have a mobility problem. If you pass test A, go on to test B. Step 1. Stand two of your foot lengths away from the wall with your back on a foam roller. The back of your head, upper back, lower back and sacrum must all touch the foam roller throughout the entire duration of the test. (Again If you have a naturally large arch in your lower back, place your hand under your lower back and press your lower back into your hand). Rx: If you pass test A but fail test B, do exercise B. You have a weakness or motor control problem. One or several of the following motor control problems are present. Luckily the complexity of the shoulder need not limit the ability of most people to find a solution to their lack of shoulder flexion range of motion. As mentioned above, the two tests above will place you in one of two categories. Failing Test B: If you passed the passive range of motion test (A) but failed the active range of motion (B) you do not need more stretching. Instead you have a limitation in motor control, strength or both. *If you failed test A but passed test B you either cheated or you are are rare exception to the norm. The inconsistency in range of motion between positions is indicatve of a motor control problem. You shoulder practice position A until your learn to do it well. I believe the following two interventions will help the vast majority of people improve their shoulder flexion. If they don’t, I recommend finding a physical therapist or other healthcare practitioner to help you identify the problem more specifically. Providers trained in Mulligan Joint Mobilization with Movement (MWM), Strain Counterstrain and Active Release Techniques (ART) are most likely to have the skills to address specific mobility problems and those trained in PNF, Feldenkrais or Reactive Neuromuscular Training are most likely to have the skills to address motor control problems. I prefer this stretch as a general shoulder flexion/abduction stretch because it focuses more on scapular mobility and the broad fascia of the latissimus dorsi which in my experience is easier to improve than the tough glenohumeral joint capsule. Furthermore this stretch is more comfortable for my patients with shoulder impingement (perhaps because it facilitates scapular upward rotation). If your performance on test A improves after stretching 3x30sec, then go to test B. Option 1: Grab a railing with the palm up. Pull away from the railing and tilt your hips away. You should feel the stretch where the arrows point and no pain. Option 2: In my opinion this version is not as effective however it is a good substitute when you can’t find a railing. Do this stretch for 3x30sec on each side taking slow breaths with long exhalation. If you breath in for 4 seconds and out for 6 seconds and take 3 breaths, this will get you to 30seconds. Repeat twice daily. Test A should improve immediately afterwards or over the course of 4 weeks of diligent stretching. Once full range of motion is achieved, use it! When it comes to motor control training, specificity is key. Only perfect practice makes perfect, and this drill is particularly good at reducing sloppy practice. Having one’s forehead resting on one’s fist reduces upper trapezius over-activity compensation and a flexed spine eliminates spinal extension compensation. Later you can progress to placing your forehead on the ground as you get more flexible. 3. Lift: Lift the shoulder from the shoulder blade using the lower trapezius to upwardly rotate and tip the shoulder blade back. Lift shown with use of yellow theraband attached to top of door frame for assistance. This picture also shows me placing my forehead on the ground without a fist under it. This is a progression of the exercise. The picture below highlights the lower trapezius which is the muscle you should feel working the most during the reach-roll-and-lift exercise. If you have good shoulder flexibility when lying on your back but bad shoulder flexibility when standing up, you have a strength or motor control limitation and should do motor control or strengthening exercises instead of stretches. Thanks for this super helpful post. My shoulders’ active ROM is significantly less than their passive ROM, and I can see that the Reach, Roll & Lift exercise could help me a lot. Do you have any tips as to how to focus the work of this exercise on the lower trapezius (which the part of my shoulder girdle that is “asleep”), as opposed to muscling through it with upper traps and deltoid? I am working on increasing my shoulder flexion to open the upper chest and upper back in my Ashtanga yoga practice, and have finally figured out that I don’t need to do more stretching. Instead, I need more strength in the lower shoulder but am struggling to isolate that area. Anyway, thanks for this great resource — please keep ’em coming! 1) If you are doing the motion correctly, you are probably activating the correct muscles even if you don’t feel them. We don’t have a very precise feedback loop for muscle activation. For example, the action of picking up something from the floor activates dozens of muscles but we aren’t aware of most of them: longissimus, multifidi, gluteals, hamstrigns etc. We can usually feel when a muscle is stretched or when it becomes fatigued but not always, we are only feel things we pay attention to and the ability to focus attention on the lower trapezius may need to be trained. In the case of the lower trapezius it may take doing the exercise several times a day for several weeks before you develop the awareness of this contraction even if it has been there all along. 2) If you are unable to do the exercise correctly (for the reach roll and lift this would be the inability to posteriorly tip and upwardly rotate the scapula) then you need to move down to an easier exercise that also has EMG research backing its effectiveness at activating lower trapezius relative to upper trapezius. See the “Prone Y” exercise. Thanks, Bryan! That is a great point about the awareness feedback loop. I saw a diagram in one of the Ray Long yoga anatomy books that compared the huge amount of brain space devoted to sensing our hands as compared to, for example, our psoas. So your point that the mind may need to catch up makes a lot of sense. My goal in strengthening the lower trapezius is to give the upper traps some support so they can chill out! And also to increase range of motion in my shoulders’ external rotation (with good alignment). Your site is really great, one of the only ones that offers the analysis AND the how-to. Excellent article, you really know your stuff. I’ve had shoulder problems for six years and know a lot about this area after lots of reading/research and this article is very solid and well founded. Highly recommended for everyone, even those who don’t know they’re tight yet. Hi, beautiful post. So nicely explained for us laymen. A few questions – please help. Wouldnt stretch A also stretch the serratus? I have severe serratus weakness so wish to avoid that. Also, what motor control exercises would you reccomend for the serratus and lower/midtraps working together while minimizing pecs, lats and levator/rhomboid or even upper traps. The serratus anterior upwardly rotates the scapula, so the overhead lat stretch depicted will not stretch to serratus anterior. The “bear hug” exercise has been found to have the most serratus anterior activation. Thank you Bryan.. so option 2 is the stretch to use correct? What about the stretch in option 1? Also reach roll and lift, is it more of a lower trap activator than a serratus one? Is it ok to do with serratus weakness, since the lower trap would already be very strong than serratus in that case. Lower trap and serratus anterior are synergist so they both are working during the reach roll and lift to upwardly rotate and posteriorly tilt the scapula. 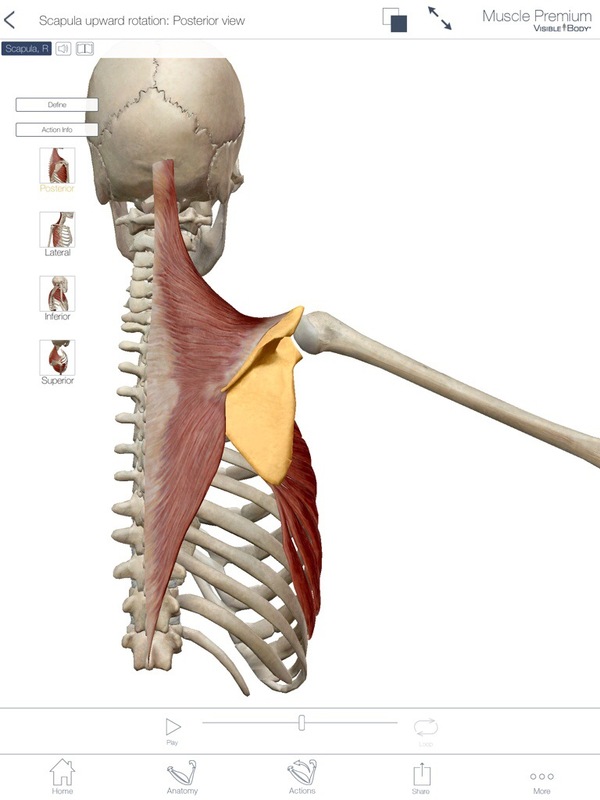 Without the serratus working the low trap would only be able to depress the scapula. If low trap is working harder during the reach roll and lift this still isn’t a problem. A weak serratus anterior does not necessarily cause a strong lower trapezius. Could tight lats work into low back issues? I pass A but fail B and have had some low back issue with failing the slump test but I’ve done stretches for it for the last four months, while it has improved I’m wondering if this works into that any. Tight lats while result in more lumbar extension during overhead activities. Some types of back pain are worsened by extension, these are called extension dysfunctions and include spondylolysis, spoondyolisthesis, stenosis, and facet joint syndrome among others. Hi I had bicep tendinitis and impingement for a year. The problem said it was the worst case she ever treated. I went to her after 3 months w another PT who she said did the right exercises but with too much weight. She switched to bands. I also have a stretched labrum superior so I have some shoulder instability. My orthopedist said I have degenerating tendons but I have improved too much for it to be that since I am at 60% – going from not being able to drive, hold a cup of coffee or even get startled without having pinching and pain. However I still have tightness and discomfort in the back rib area near the scalp. It snaps if I stretch it when it is tight. I broke my left leg at age 14 so my left shoulder is lower than the right and the right twists forward. I pass A but fail B. In fact most of my life I walked w my ribs out chest forward. Maybe since Trying to cottrct this by pulling my abs and ribs in and externally rotating the shoulders I have A LOT of muscle shortening???? Joint facet problems?? I would appreciate any insight you might have. There is a point of discomfort in one spot near the scalp and rib and then there is a tight band from the top of the shoulder that runs at an angle to my middle lower back lats?? Hi Anne, thanks for your interest but your question is beyond the scope of a reply without a physical evaluation. Genius! I just did the motor control exercises and they activate the muscle pain which is more a pulling discomfort than pain in the areas mentioned in the last post. It is difficult for me without bands but I will be diligent about doing it 3x a day. What do you do with your good shoulder? How do you avoid asymmetric muscles and strength? Okay, can you delete my posts thanks! If I cannot find a good railing for the A stretch, can I simply use a suspension trainer? Yes, but it isn’t quite as effective as the handle will twist and you will lost the shoulder external rotation. My other question is what height is ideal for the railing? Chest height? Also, will stretch A stretch the serratus anterior as well? The ideal height for the railing is about chest height. The railing stretch does not stretch the serratus anterior, but I also see no need to stretch the serratus anterior if the goal is to gain shoulder flexion as the serratus anterior shortens during shoulder flexion.